← Samsung GS5 Nethunter is Kali in my Hands! While a bit late, I finally found (some) files to do a BSides Raleigh CTF write-up. This will only focus on the few offline challenges that I found on my flash drive. That said, hopefully someone will still learn something from them. I apologize where not remembering where most of these challenges came from, that said, I believe most were in the same section of the CTF. I've verified that the uploaded and attached files work, so feel free to follow along if you did not compete! The first challenge that I will cover is the Halloween image. At first glance, I didn't see anything interesting with this image. Additionally, running strings on the file did not give me any more information. That said, once I ran binwalk, thinks started getting interesting! Extracting the binary files using binwalk gave us the new file, "r". Opening the new r file, we see another image, and get our flag (SUchGR3@th4X)! The next challenge covers the two images seemingly made up of static. That said, after taking a closer look at the two files (and rapidly switching between them), there was a slight difference somewhere in the middle. Using a neat trick that I found on the ImageMagick Forums, I was able to extract the diff. 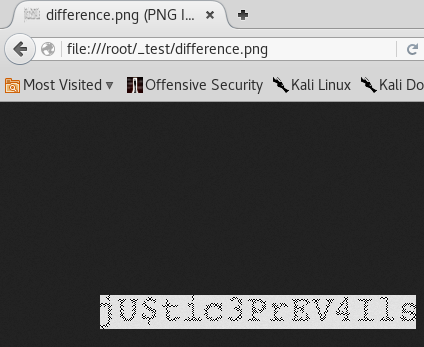 Opening the new image gave me the jU$tic3PrEV4Ils flag! Up next was the artifact file left behind by the attackers. At first glance, this looked like some sort of binary data. Quickly running the file through XXD showed that the magic bytes were nulled out. 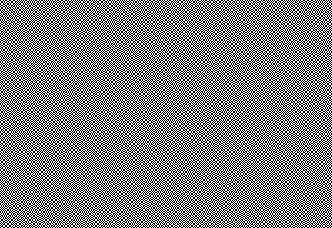 That said, looking at the next few bytes (as well as the end of the file) made it very clear that this was a PNG image. 0000230: 0351 12fd 3af1 fb00 0000 0049 454e 44ae  .Q..:......IEND. 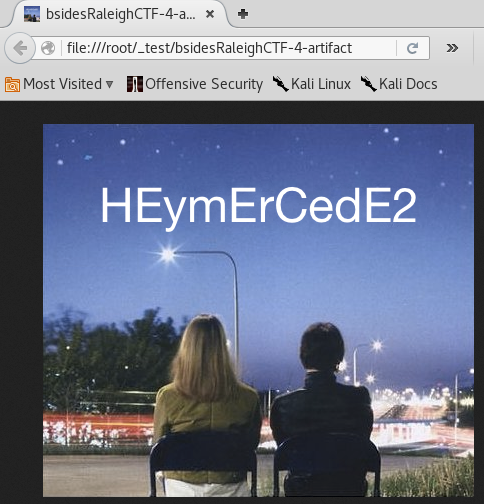 Correcting the PNG magic bytes allowed me to open the file and get the flag (HEymErCedE2)! 00000000: 8950 4e47 0d0a                           .PNG..
Next up was the suspicious_traffic-1.pcap file. Opening up this file in Wireshark showed that it only had ~500 packets, so I decided to just comb through it manually. All of the traffic seemed to revolve around the 192.168.0.100 host, so filtering on it didn't help much. That said, there were some commands being sent over UDP to the 224.0.0.1 host. Looking through all of these commands, I found a flag (Gh0$tm4n0n3rd) that worked! As far as the other commands were concerned, they were actually hints for a different/older challenge. After this was yet another pcap challenge. Unfortunately, in this case, I had a much larger file with over 17,000 packets. In this case, I like to open up the pcap in Wireshark and scroll through it, trying to get a feel for what was going on. The first thing I noticed was a "Host Announcement FIRP-JENKINS, Workstation, Server, NT Workstation, NT Server". Unfortunately, this was related to a new host on the network and a different challenge. Most of the pcap seemed like fairly normal traffic and browsing until I happened across a fishy looking DNS request. Based on the domain name, this was part of this challenge. Running the second part of the domain name through a base64 decoder gave me the value "checking". This told me that my "attacker" was testing his DNS exfiltration, and that I was on the right track! In this case, I wanted to work on my command-line kung fu and extract everything all at once. First, after a bit of prodding and Google-ing, I figured out how to get tshark to only show me DNS traffic. [string "/usr/share/wireshark/init.lua"]:44: dofile has been disabled due to running Wireshark as superuser. See https://wiki.wireshark.org/CaptureSetup/CapturePrivileges for help in running Wireshark as an unprivileged user. Unfortunately, this still gave far too many results to go through manually. With my cut working, it was time to get just the second string and run it through a decoder. I ended up using Python for this to save some headaches with padding and extra whitespace. I'll include the code below the solution. My Python script ended up finding 3 flags, as well as some hints about some other challenges! The first flag was "tehskylark", the second was "4m3r1c@nF00tB411", and the third was "Y0UC4N7m1SSWh47y0ufRGE7". I wish I still had some write-ups or information about the online challenges, but this was all I had saved. This was another great CTF put on by EverSec and I was glad to compete in it. In the end, I ended up winning this and getting a Pineapple Nano as my prize!